My mentor, Maia Berens, has taught me many lessons since we virtually met years ago. She came into my mind this morning as I was journaling about certain important lessons in my own life. Maia has learned to work with certain health issues. She can eat anything and everything, but she shouldn’t. There are certain foods that create havoc in Maia’s body and make her feel uncomfortable. She’s chosen to care for herself by avoiding and substituting those foods vs. being careless and suffering the consequences. Well, the lesson I have learned from Maia’s way of self care relates to my own issues with anxiety and depression. These conditions have accompanied me for most of my life. When life becomes stressful, they seem to invite themselves in and make way. These unwanted visitors are closely linked to my old thought patterns and self-image. I don’t always care for myself and many times create havoc in my life because of the choices I make. And then, the visitors are back. So I take responsibility for what happens to me. I know there are certain disciplines I need to practice daily and consistently in order to maintain balance and harmony in my life. Consistency and commitment to myself are key in remaining balanced. Because, it’s not that I don’t do what I need to do, I just do it some of the time. I grow more aware that loving myself is a moment to moment activity. • Be more present in each activity I undertake, no matter how common it is…such as washing the dishes. • Taking time to rest and also enjoy life. Have more fun. Don’t get me wrong, I do most of these regularly, but not consistently, and not all of them. I have a tendency to get lost in my thoughts and in the doing. Like Maia, it’s a matter of making loving myself my upmost priority. My quality of life depends on it!!! I was very depressed by going on domestic and financial condition.And I was felt that I am not caring myself due those conditions.Then I visited to www.meredithhaberfeld.com and had an apointment for some kind of coaching.Then I did it and feeling very better now. Love this post! So true, working on this myself. 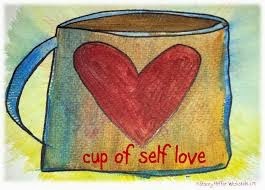 I have learned the hard way the consequences of not loving myself enough and putting other's needs and priorities before my own. I can certainly take some very good information away from this great blog Savina. I see how much my feelings are intertwined with the the rest of my being - physical & spiritual. When I truly take care of ALL of me, my emotions thank me. Thank you Gina and CG for your comments.